Two days ago I covered the planned reduction in frequency of the 492 bus from Sidcup to Bluewater Shopping Centre from an already poor 30 minute interval. Thanks to the heads up from readers who have pointed out that another bus to Bluewater is to be altered, and this time with half the route removed from January 2019. 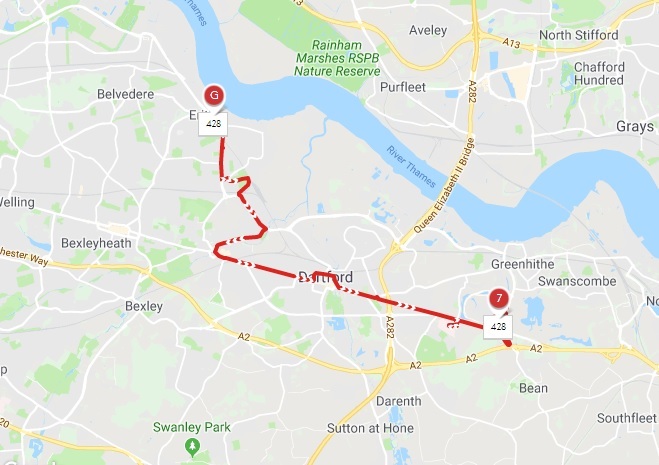 The 428, which starts at Erith, is being cut entirely between Crayford and Bluewater via Dartford and Darenth Valley Hospital. TfL are truncating the route to the edge of London at Crayford. It will no longer serve Kent which means Dartford loses out (they will have to rely more on expensive, unregulated local services). One severe impact will be a reduction to Darenth Valley hospital. This will affect patients within London who need to reach the site. Darenth Valley hospital is already poorly served by public transport. Much like Queen Elizabeth Hospital in Woolwich, it was built using the PFI model in the late 1990s, and like QE, located in an area that is far from useful for those reliant on public transport. Rail access is especially poor. Well, non-existent. TfL’s funds have been heavily hit by a £700 million annual cut in funds from central Government announced by George Osborne in 2015. Osborne’s cut meant that London would be the only major world city with no government assistance in the operating day-to-day budget of its transport network. A fare freeze announced by London Mayor Sadiq Khan has also hit revenues though he argues freezing fares has helped hold up passenger numbers despite a recent fall, which would have been worse without continuing freezes according to the Mayor. Whatever the reality, buses are being cut on routes solely within London, so it’s little surprise to see cuts on those routes extending beyond the city boundary. If you enjoy the site, please consider donating via Patreon or Ko-Fo. This is probably more to do with Kent County Council not wanting to fund the service outside the TfL boundary – which ends at Crayford. Lack of funding from KCC has already seen TfL cut back c oss boundary services in the Orpington area. Passengers to Darenth Valley and Bluewater can change buses for free at Crayford for the 96 using the hopper fare. Unfortunate for passengers, but KCC won’t pay their fair share for the service. The 428 is about to become an unusually short bus route. The entire snipped section is matched by the 96. TfL have previous form removing doubled-up routes outside the Greater London boundary. Last year they removed one of two services between Loughton and Debden when Essex CC withdrew funding. It’ll now be a very short route. I’m surprised the other end isn’t extended to Abbey Wood to connect with Crossrail. Would be handy for those in Crayford not having to change, and there’s only 2 trains an hour planned to run between Crayford and Abbey Wood stations. So anyone in Slade Green who doesn’t drive now can’t get to any hospital directly as it will be two buses. Can a petition be started. They can take the 89 to QE hospital as it stops 5 minutes down the road. It’s a shame the 428 is being cut though but the grant being removed from TfL and Sadiq’s populist fair freeze is like a double edged sword against bus services in London. aww, you need a cookie? Why should a London bus serve Kent anyway? Move inside the boundary if you want red TFL buses at your disposal. Thats a incredibly selfish response.Having lived outside the boundary i know how incredibly poor and very expensive the bus service is.Totally unreliable.Many areas don’t even have a service.Many that do get nothing after 6pm or Sundays. The London service is far from perfect but its cheap and its useable for most. If you knew me, you would know that I am not at all selfish. All I am saying here is….If you want to use London Transport and receive the benefits it provides over out of town rural services , then live in a London borough, pay London taxes, London rents or London property prices and you will receive those services. Not being selfish, just being realistic and nothing more……I wouldn’t expect to receive the local resident discount for the Dartford Crossing if I didn’t live local to it…..If I wanted that discount, I would accept that I would need to live in Dartford to qualify for it….If fares and service levels are poor in your area, it is not TFL’s fault, it is something you need to take up with your LOCAL authorities. Hipefully, the savings made by London Transport for this wise business decision will go towards enhancing the services INSIDE THE BOUNDARY so that Londoners are receiving optimal travel services as we fund it through our taxes. For many of us in SE London our doctors send us to Darenth Valley which happens to be outside London. Ask them to send you to a london location instead. You are entitled to that…. The 428 is being converted to double deck and chopped to run between Erith and Crayford doesn’t make any sense at all. I’m surprised that the 469 isn’t being extended from Erith to Crayford instead. That would be in keeping with Sadiq Khan’s aim to improve bus links into hospitals as well as providing new direct links from Bexley borough into the Elizabeth Line at Abbey Wood. The changes in SE London for buses simply do not make any sense whatsoever. The Mayor of London Sadiq Khan and TFL promised to improve bus services in outer London when cuts were made to bus services in Central London. This now does not appear to be happening. A Outer London bus route cut and a route (428) which serves a Darent Valley Hospital which many patients from South East London are referred to by GP’s and for some specialist services. This is particular hard where train services are limited to sometimes only two an hour and the Boroughs are not well served by the London Underground system.